Gulab Jamun is one of India’s most popular sweet. 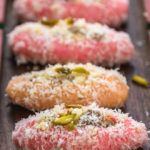 These deep-fried dumplings/donuts made of dried milk [khoya] are dipped in a rose-cardamom flavored sugar syrup and make quite a treat. In India, you would find gulab jamun at every wedding, party, birthday and festivals. In short if you arrange any Indian party and plan to keep only one dessert, chances are it will be gulab jamun! 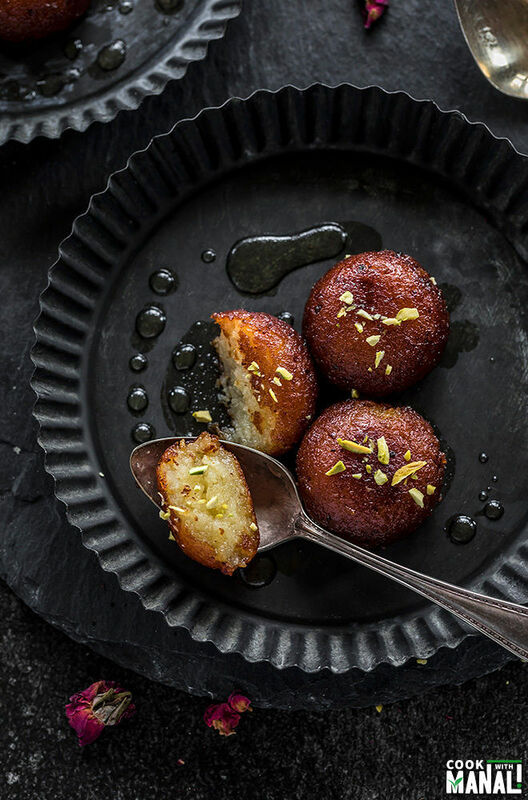 With the festive season about to begin, I had to share my favorite melt-in-mouth gulab jamun recipe with you guys. I know people often assume it to be a difficult dessert but trust me, it’s quite simple to make it at home if you take some basic precautions while making it. So, let’s start with the very basic! How Is Gulab Jamun Made? Traditionally, gulab jamun is made using khoya which is nothing but milk solids. To make khoya, we cook milk until only solids are left. At my home, mom always made khoya from scratch but it’s a tedious process. It takes hours for the milk to reduce and your hands are done by then with all the juggling. To cut short the process, buy khoya from outside. In India, its readily available at sweet shops, here in the US you can find it at Indian grocery stores in the freezer section. Gulab Jamuns can also be made using milk powder but I prefer the jamuns made with khoya, taste just the best. 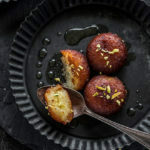 How to Make The Best Melt-In-Mouth Gulab Jamuns? Take care of these things at every step of making the gulab jamun! 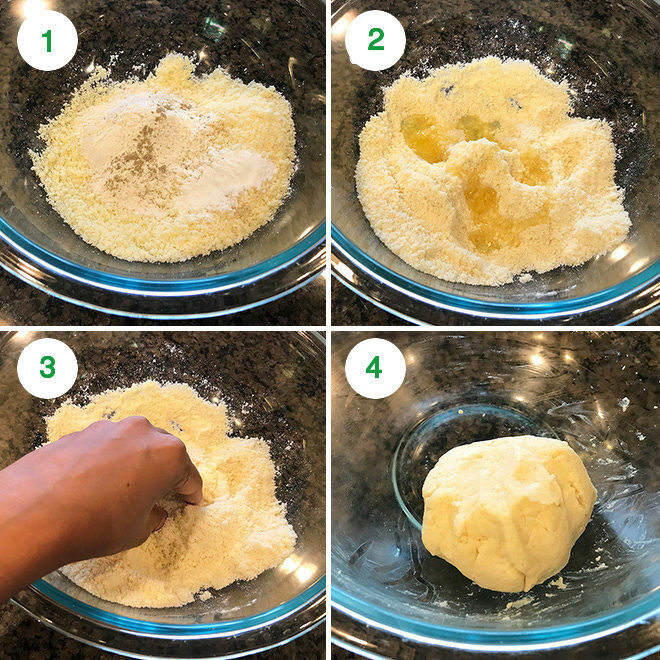 While making the dough: the dough needs to be smooth and soft. So, add warm milk, little by little until you have a soft dough. But at the same time, you also have to keep in mind that you don’t want to over knead the dough. Mix until the dough comes together and then let it rest for 15-20 minutes. 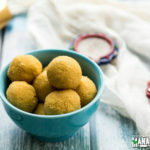 While making the gulab jamun balls: use soft hands and do not apply too much pressure while rolling the balls. Work with soft hands! 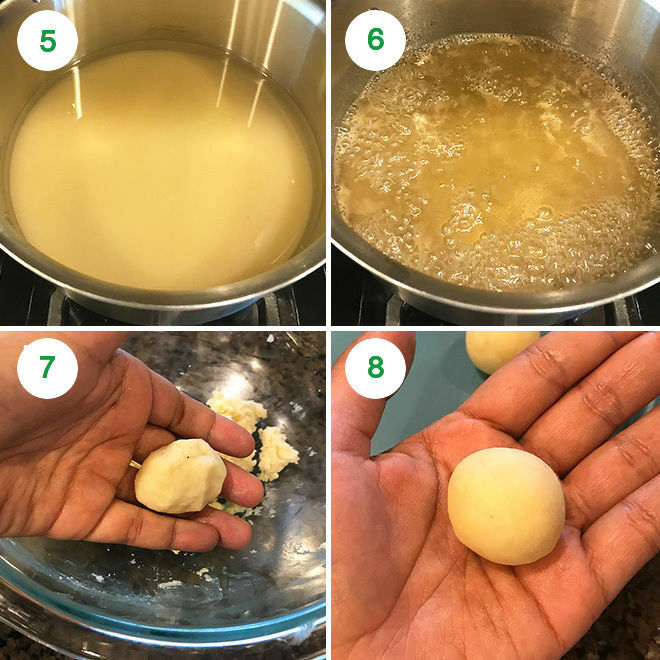 The gulab jamun balls should be totally smooth without any crack. If you see cracks on top, knead again till it’s all smooth. While frying the gulab jamuns: the most important thing is to fry at medium-low heat. If you fry at high heat, the jamuns will not be cooked from inside and will also turn hard. It’s best to first heat oil/ghee at medium heat for 5 minutes, then low the heat to low and then drop the balls in the oil. Fry on low heat until they are nice dark golden brown in color. This will take time as you fry on low heat, be patient. Making the sugar syrup: Don’t look for any consistency while making the sugar syrup. Add all ingredients for the syrup in a pan and once it comes to a boil, let it simmer for 5 to 6 minutes only. It should only be little sticky. You don’t want to get to any thread consistency stage. The syrup might look thin to you after simmering for 5 minutes but that’s plenty. It thickens up as it cools. You don’t want a thick sugar syrup to begin with else the jamuns will never absorb it. Adding the gulab jamuns to syrup: while adding the jamuns to the syrup, make sure the syrup is warm but not hot. The gulab jamuns will likely lose their shape if the syrup is too hot and they will not absorb the syrup if the syrup is cold. So warm is what you need. 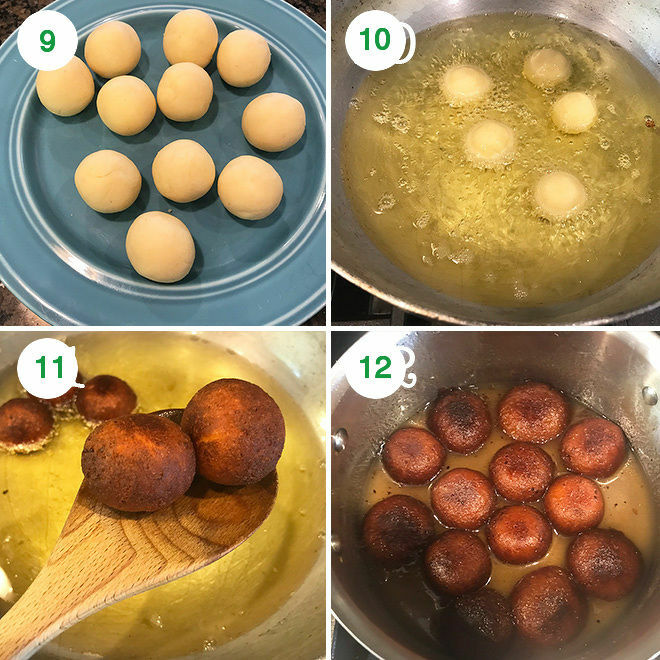 With those tips in mind, let’s address the most common questions/problems that we face while making gulab jamuns at home! Why are my gulab jamuns hard? You fried the balls on high heat. Why are my gulab jamuns too soft? You added too much of baking soda/powder. Why are my gulab jaumns not cooked from inside? You fried them in hot oil, they got cooked from outside but from inside. Heat needs to be medium-low. You syrup is either too thick or too thin. You need to bring it to a boil and then simmer for 5 minutes only. It should be little sticky, that’s all. If its not sticky at all- boil some more. If it’s too sticky and forms threads, you have gone a bit too far. Remember sugar syrup will thicken as it cools down. Do not look for any thread consistency, a light sticky syrup is enough. 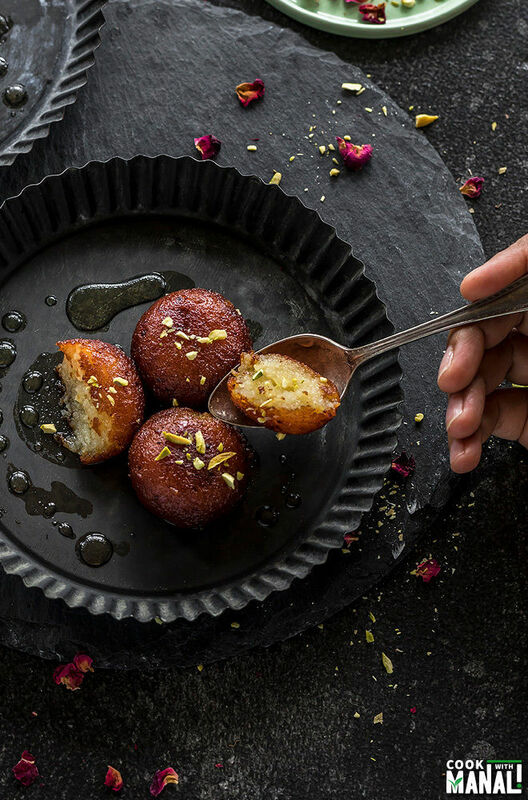 If you keep all these tips and tricks in mind, you will end up with the most delicious melt-in-mouth gulab jamuns! 1- In a large mix together grated khoya, maida (all purpose flour), cardamom powder and baking powder. Mix until well combined. 2- Add melted ghee to the bowl. 3- Use your fingers to mix ghee with the khoya and maida. 4- Start adding warm milk, little by little until it all comes together as a dough. Don’t knead the dough too much. Just bring it all together to a smooth dough. Cover and let it rest for 20 minutes. 5- Meanwhile to wide a pan add sugar, water, cardamom powder, rose water and kewra essence (if using). 6- Bring it to a boil. Add lemon juice. Then lower the heat and let the syrup simmer for 5 to 6 minutes. Once it’s a little sticky after 5 minutes, remove pan from heat and set aside. Keep it warm. 7- Now give a quick knead to the dough. Make a small ball out of it. Work with soft hands and squeeze the ball between your palm to shape it. 8- Form a smooth round ball with no cracks. 9- Repeat with the remaining dough. I got 14 balls of 15 grams each. 10- Heat oil in wide kadai/pan on medium heat. Heat oil for 5 minutes on medium heat and then lower the heat to low-medium. Add the jamuns to the warm (not hot) oil. Fry until golden-brown. This will take few minutes, keep rotating the jamuns regularly with a spatula so that they get cooked evenly. 11- Once they are dark brown in color, remove them from the oil. 12- Soak the gulab jamuns in warm (not hot & not cold) sugar syrup. Let it soak the syrup for 30 minutes. Garnish with pistachios and serve gulab jamun warm or cold. You may also decorate them with edible silver leaf (chandi ka vark). 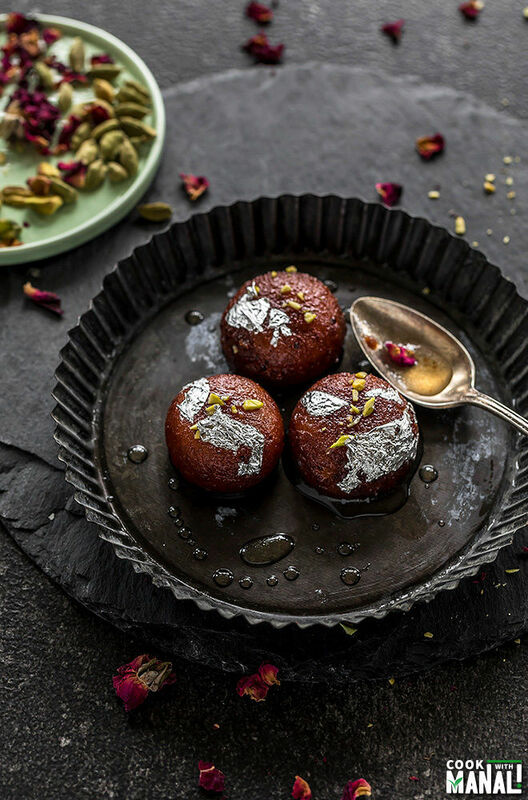 If you’ve tried this Gulab Jamun Recipe then don’t forget to rate the recipe! You can also follow me on Facebook, Instagram to see what’s latest in my kitchen! 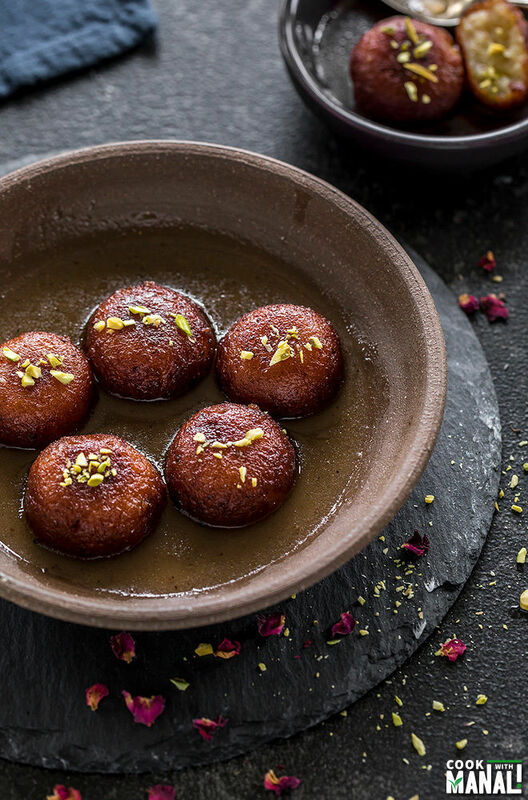 Gulab Jamun - one of India's most popular sweet, these sweet round balls are made with khoya [dried milk] and dipped in a rose and cardamom flavored sugar syrup! In a large mix together grated khoya, maida (all purpose flour), cardamom powder and baking powder. Mix until well combined. Add melted ghee to the bowl. Use your fingers to mix ghee with the khoya and maida. Start adding warm milk, little by little until it all comes together as a dough. Don’t knead the dough too much. Just bring it all together to a smooth dough. Cover and let it rest for 20 minutes. Meanwhile to wide a pan add sugar, water, cardamom powder, rose water and kewra essence (if using). Bring it to a boil. Add lemon juice. Then lower the heat and let the syrup simmer for 5 to 6 minutes. Once it’s a little sticky after 5 minutes, remove pan from heat and set aside. Keep it warm. Now give a quick knead to the dough. Make a small ball out of it. Work with soft hands and squeeze the ball between your palm to shape it. Form a smooth round ball with no cracks. Repeat with the remaining dough. I got 14 balls of 15 grams each. Heat oil in wide kadai/pan on medium heat. Heat oil for 5 minutes on medium heat and then lower the heat to low-medium. Add the jamuns to the warm (not hot) oil. Fry until golden-brown. This will take few minutes, keep rotating the jamuns regularly with a spatula so that they get cooked evenly. Once they are dark brown in color, remove them from the oil. Drop the gulab jamuns in warm (not hot & not cold) sugar syrup. Let it soak the syrup for at least 30 minutes. Garnish with pistachios and serve warm or cold. You may also decorate them with edible silver leaf (chandi ka vark). I adore gulab jamun! They are my weakness!!! I’ve nver made my own so thank you for your detailed description – not to mention totally mouthwatering pictures! Wow those are perfectly shaped! I could almost imagine they were machine made! I can’t believe you cooked down your own milk to a solid. That is impressive. These sound delicious but I don’t think I would trust myself to make them properly. <– So, I'm coming over! Thank you Lindsey and please come over! I have too many sweets at home these days, thanks to Diwali 🙂 Oh yes cooking down the milk was a challenge, it was really tiring but I’m happy with the end result! Hi Manali, our friends from India told us so much about Diwali! Your gulab jamun looks very tempting and love the spices you used. You always have such interesting food posted that I’ve never even heard of! Neat to hear about the food elsewhere in the world! These look really good, I’d love to try them sometime! Thanks Michele! it’s not really like fried dough since it’s mostly dried milk that is fried! These look so tasty, Manali! You’re recipes are always different and lovely. Pinned! Helli Manali! So glad to have stumbled across your blog. The gula jamuns loom perfect and so tempting. I had these at a party recently! They were so delicious – I was wondering how they were made. Thanks for the recipe! You are welcome 🙂 Hope you give them a try! Thanks Vicky, glad you like! Can we skip maida? Or use cornflour instead? Because I can’t have maida. I have Gluten intolerance but so badly wanna try this? Looking forward to your reply. Hi Wafa, not sure about that. You do get Gluten free flours right? Try that in stead. Cornflour or rice flour might also work, never tried it personally. I just made gulab jamuns. As soon as i finished frying one batch i immediately put them in the hot syrup.the jamuns didnt change shape but they r too soft inside and not firm. What could be the reason. Is it the hot syrup? hmm too soft as in they were breaking/dissolving in the syrup? Hi. Great recipe. 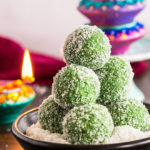 I had once made gulabjamun with khoya but now I live in Germany and khoya is not available here and I don’t like the flavor of dry milk powder so I want to make my own khoya so plz guide me about khoya and how much milk required to make khoya for this recipe? Do we need to add anything else in milk to make khoya? Hey there! 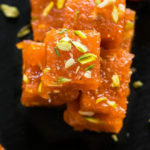 check out all easy recipes to make khoya at home here – https://www.ruchiskitchen.com/recipe/how-to-make-mawa-5-ways-of-making-mawa/ hope this helps! Can you please let me know if you used the sweetened mava or unsweetened one in this recipe? hmm I didn’t know there was sweetened mawa available as well..I have used simple unsweetened mawa..
Beautiful tempting pictures Manali. This Diwali I’m definitely making Gulab jamuns as my older one loves them and well, we all do infact …lol! The stepwise pics really help…. Thank you Manju! Glad you found it helpful! The pictures are awesome .. I have pinned it ..
Gulab jamun is one of my favorite sweet.I will try it.Thanks for shearing..
Looks delicious. The step by step instructions is very clear to understand. While searching for a recipe to make perfect gulsb jamuns with khoya, I stumbled upon your page. Very well written. Before I try this recipe, I wanted to check if there is a video available for this recipe of yours? How exactly the dough is made? Like we make a wheat flour dough for chapati? Hi Ankita! Sorry, there’s no video available for this recipe right now. Yes you make a smooth dough, like you make for chapati. Just follow all the instructions and they should turn out well. Good luck! wow, this is delicious Kalo jump that calls to India. I like this sweet very much and my favorite sweet dish. Thank you very much for sharing. Hi , I tried this and it came out very well ..
good to know Suma! 🙂 these are my favorite!